Be a DOTME personnel and have a smile always. In order to promote fairness and to prevent fraud,we have set these rules to help us protect the project from all kind of mischievous activities. * You must be a member of bitcointalk.org,registration must be before OCTOBER 2RD 2017. * You must make useful comment or suggestions in any of our communities at least 3 times a week. everyone on the first come first serve basis. 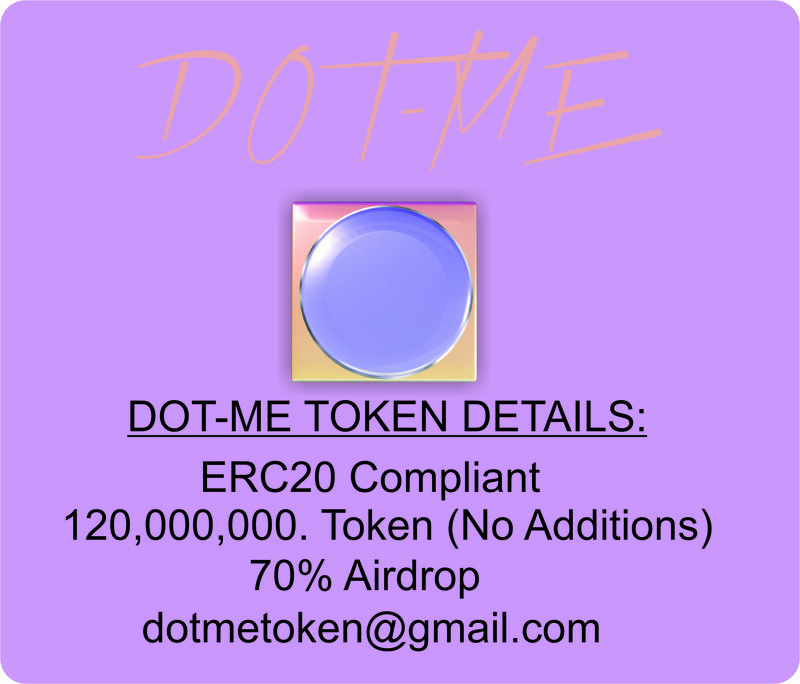 * Finally the dotme team reserves the right to to disqualify or ban any participant that do not respect our terms and conditions or show any type of behavior we deem inappropriate. There would be 3 rounds of airdrop,each round has its own rules and would be greatly influence by the community through discussions and voting. There would be an update as we progress and all terms and conditions would be make known to all interested, provided they meet all requirements. 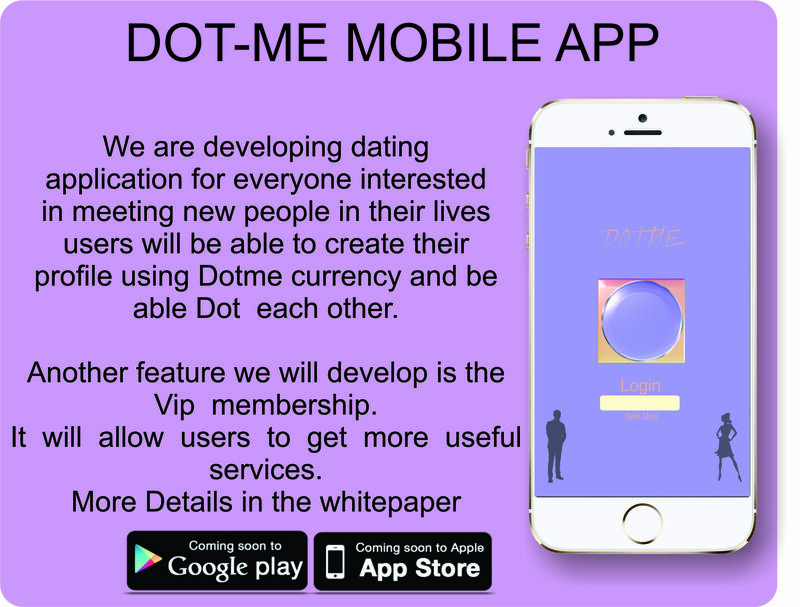 Smartphones are making lives easier by bringing online dating at the fingertips of thousands and we intend to use blockchain technology to provide total freedom to anyone who want to meet new people without any restrictions with the use of mobile phones. THE FIRST SET OF UPDATE TO EXPECT IS WHAT HAPPEN NEXT AFTER PARTICIPATING. NOTE:YOU ARE ALLOWED TO ASK QUESTIONS IN RELATION TO THIS PROJECT ONLY. PLS PLS DO NOT ASK US WHEN, AS WE WORK WITH THE INTEREST OF THE COMMUNITY/INVESTOR AND WE WILL GIVE UPDATE AS AND WHEN THEY BECOME AVAILABLE. DO NOT FORGET THIS IS NOT RUN BY ONE PERSON. WELCOME AND GET READY TO CHANGE YOUR LIFE WITH NEW PEOPLE..
We are holding a contest to design signature for our upcoming promotion for Dotme.The design might be added to the website whihc is been design and credit giving to the designer if we see a particularly attractive work That we might like. - Jr. Member: Links allowed. Max 150 characters. -Everybody is free to join the contest. All signatures must be posted on this topic.You have 1 weeks from the post date to come up with your designs. We may extend the deadline if needed, but can also stop the contest earlier if we are satisfied with the entries. -Decide your own text, make it creative! We encourage out of the box ideas. -The community will be given a poll to select the best signature, however, Dotme Team reserve the right to select a signature. _ Send us a pm on telegram so we can provide you with any other information you might need. We have allotted 150,000DTM to reward the winners of the signature. It will be divided among all the entries which we would like to use their design. We are also hiring bounty manager and you can apply via same form and pm us in telegram for futher discussion and we have allocated 100,000dtm for that. Good luck with project development. There will soon be some great development coming. This is going to be used in most places. The concept is really great! Cant access the spread sheet , please fix it . but are you planning to have a detailed whitepaper or website? Can u open spreadsheet pls? Participants do not have access to it. So you are building an app like tinder but with crypto? Are you making the app decentralize? And what's the advantage of making it decentralize? When Bounty Sigcamp? Good Project Dev. Its very interesting and great project as well so that i will support it. More plans for this and also build big team.. I contribute by means of sharing about the to social medias. Joined your Airdrop, thank you. When will be the distribution of tokens and Exchanges? and also we need more explanation about your project. i wish the best for your project.